Tenerife has a beautiful year-round warm sunny climate, that is rarely too hot or cold, instead providing superb temperatures for visitors and residents alike to enjoy a wonderful outdoor lifestyle. In addition to this, the island is blessed with some amazing beaches dotted all around the coastline which are perfect during practically any month of the year, due to the fantastic climate! 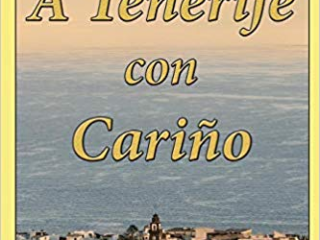 What you will notice about Tenerife though in comparison to almost all other coastal locations in Europe, including some of the Canary Islands themselves, is that many of the beaches consist of black sand and/or stones. This is due to both the volcanic nature of the nature of the island, but also the particular conditions of Tenerife. While these black sand beaches do look very unique if you are used to sunbathing on beaches in locations such as mainland Spain or Italy and are certainly excellent in their own nature, there is also something very special about golden sandy beaches, especially on a bright, warm sunny day, as they perfectly portray that holiday vibe. Luckily, if you are staying in Tenerife and are looking for a picturesque golden sandy beach to contrast with the darker sands, there are number of different options. One of the best of these, is definitely Playa de Abama (Abama beach) located on the South-West coast of the island in between Costa Adeje and Los Gigantes, in the Guía de Isora region. This is an absolutely beautiful beach with soft, golden sand, plenty of sun-loungers and calm waters due to the placement of large rocks close to shore, that perfectly protect the beach from larger waves, creating safe swimming conditions. 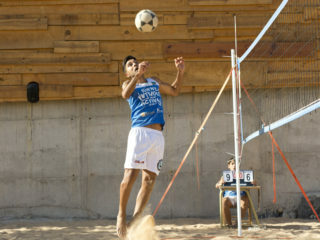 While the sand has been imported and placed artificially, this in no way detracts from the attractiveness of the beach which instead stands out superbly in comparison to the darker sand beaches in nearby towns such as Callao Salvaje, Playa san Juan or Alcalá. Located in a cove with banana tree plantations up on the hills, amazing cliffs and the luxurious Hotel Abama looking down onto the beach, the surroundings are amazing. While the beach can certainly become busy, especially at the weekends or during holidays, it is still a world away from the busy tourist areas of Costa Adeje, Playa de las Americas and Los Cristianos. Instead there is a tranquil, calm and almost private feel to the beach with no loud music or people trying to promote bars, restaurants or excursions. Instead you can enjoy this Playa de Abama in peace and quiet, sunbathing on the golden sand, swimming in the safe waters or exploring the adjacent rock pools. 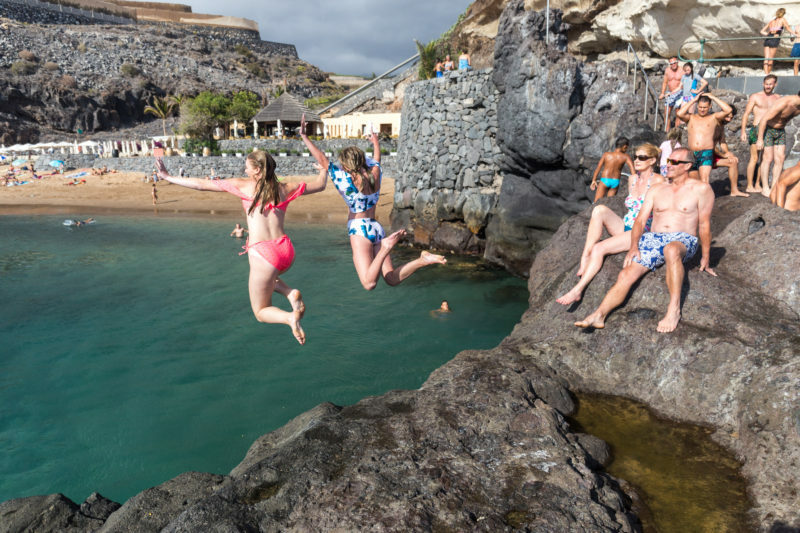 It is also fun to dive or jump off the sea wall into the ocean which is especially popular with kids and teens. 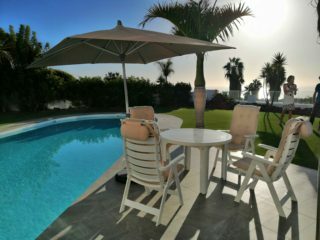 As well as being perfect for guests of Hotel Abama, Playa de Abama is also ideal if you are staying at the stunning Las Terrazas de Abama which is across the main road that connects the towns of the South coast. While it would take around 30 minutes to walk from Las Terrazas de Abama to the beach or a five minute drive (plus the walk from the car park down to the beach), for guests staying at the hotel, there is a superb private mini-bus service. This will drive guests right down next to the beach, then pick them up when they are ready to leave, as shown in the video, plus, there are even beach towels provided. This is an excellent service which removes any hassle and allows you to completely enjoy the beautiful Playa de Abama. 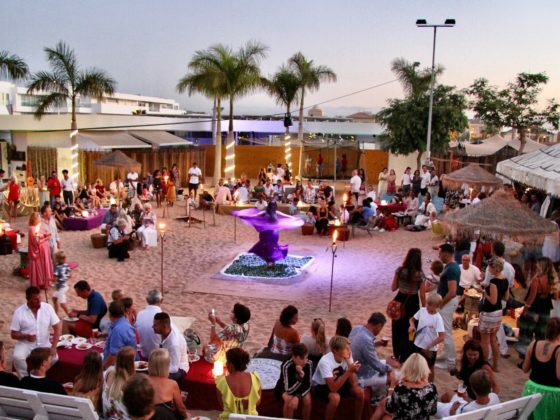 As you can see from the video earlier in this post, the beach is absolutely perfect for families as there is something for everyone to enjoy, plus it’s also fantastic for groups of friends or couples. While Tenerife has an abundance of stunning beaches throughout the island, Playa de Abama really does stand out as a bit of a hidden gem! It is neatly nestled down in a cove, surrounded by banana plantations, in a secluded spot at the bottom of a hill. The views out to La Gomera on the horizon are superb and it is a gorgeous spot to relax as the sun starts to set. 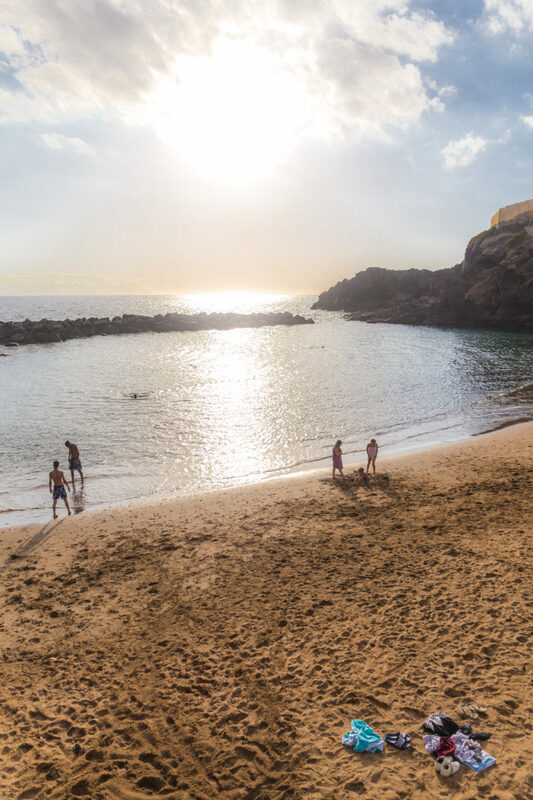 If you are staying in the south of Tenerife and are a looking for an excellent beach, then you need not look any further and instead make your way to Playa Abama for some much deserved rest and relaxation on the gorgeous golden sand. Have a fantastic time!